The recession of recent times and changes in regulatory control together with ever increasing economic pressures coupled with evolving technologies has ensured that Target Operating Models are becoming more prevalent for many organisations – and they then have to adapt accordingly, not just to be or stay competitive, but also to remain ‘ahead of the curve’ to ensure their market position can be both attained and remain secure. This case for change may focus on performance improvement, increasing profitability, or the successful integration of a new business operation for the organisation (e.g., systems, acquisitions, new product / service market entry, etc). 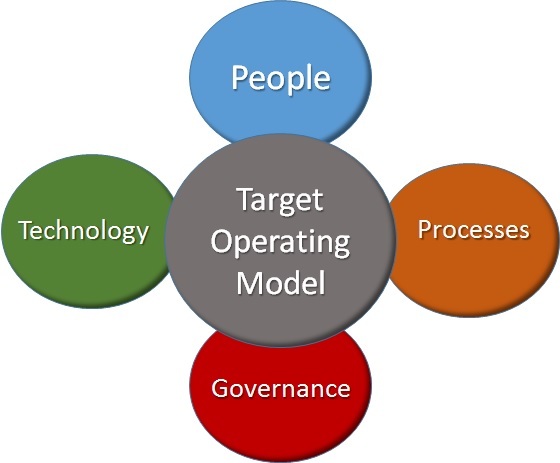 The primary purpose of a Target Operating Model (TOM) is to enable the application of a corporate strategy or the vision of a particular business or operation. It is a high level representation of how an organisation could be better organised in order to deliver and execute the organisation’s overall strategy more efficiently and more effectively. It also provides a simpler and common understanding of the organisation by allowing people to visualise the organisation from a variety of perspectives across the value chain as every significant element of business activity is represented. The TOM approach combines the core elements of the organisation, these being People, Processes, Technology and Governance. The importance of this is to better understand the current organisation and define a future operating model which will enable the organisation to achieve its strategic goals. These can be evaluated independently and all are critical to ensure its ultimate success. The suppliers and business partners needed outside the organisation to support the processes and capabilities and the types of agreements between this organisation and these partners. Target Operating Models provide the vision for any organisation that is undergoing change. The reason for the need of any new TOM is likely to be the introduction of a new business strategy or a new business model or even possibly because there has been a significant failure in the performance of an existing business operation for one or more stakeholders. The end outcome is a defined target end-state and a roadmap for the organisation to reach there through a combination of process and technology changes. Hence any Target Operating Model will always be closely linked to any business strategy. Form follows Function; or in other words… TOM follows Strategy. A good place to start is with a ‘value-chain’ roadmap. First identify the product/market segments that the organisation is serving. Clarify the offer being given to each segment. Then define, for each segment separately, the ‘value-chain’ of activities that is needed to deliver the offer. Different ‘value-chains’ can then be compared side by side in order to identify steps in the chain or activities that can be “aggregated” to gain economies of scale or “standardised” to gain consistency or “separated” to gain local adaption. These choices then lead directly to organisational implications. TOM work can be done at different levels of detail. At the highest level is the strategy or the design principles. Then comes a rough sketch, probably in the form of a ‘value-chain’ roadmap or organisational model. Then comes more and more layers of detail arriving finally at the ultimate detail level of job descriptions for every job, floor layouts for offices or factories (whichever is relevant to your operation), KPIs for every department, draft contracts for every supplier, data input and output specifications for every software application, etc.